Welcome back for Day 29 of our 31 Days of Horror series! Only two more days after today….EEP! This will be my final review of the month, and Charles will bring it home with reviews on Days 30 and 31. Today, though, we’re talking about James Watkins’ The Woman in Black (2012). This movie, starring Daniel Radcliffe, is an adaptation of Susan Hill’s 1983 horror novella of the same name. Interestingly enough, The Woman in Black is also an immensely successful stage play in London–the second longest-running play in the history of the West End, after The Mouse Trap. Several years ago, my husband and I happened upon a production of the play in Fort Worth, TX, and it is EXCELLENT. At first, I was skeptical because there are only two actors and very few props. I thought it was going to be the kind of pretentious, overly-artsy production beloved by people who say “theatah” and no one else. Suffice it to say, I was completely delighted to be wrong. If you have the chance, I highly recommend buying some tickets and checking it out. It is scary as hell, and particularly impressive given the minimalistic approach. But, alas, we are not here to talk about the play! I did not enjoy the 2012 movie as much as the stage performance, but Watkins’ adaptation IS eerie and decently well done. The story is set in the late 19th century, and centers around young junior solicitor, Arthur Kipps (Radcliffe), who is still grieving over the beautiful wife he lost during childbirth. Serving as a painful reminder of that loss is Arthur’s young son, Joseph. It quickly becomes apparent that, despite his best efforts, Arthur’s grief has impeded his ability to perform at work, and his employer gives him one last case to prove his commitment to the law firm. For Joseph’s sake, Arthur agrees, and he proceeds by train to the gloomy Eel Marsh House. We learn that the former mistress of the house, Mrs. Alice Drablow, has passed away and Arthur’s assignment is to sort through the mountain of paperwork and tidy up the widow’s legal affairs. After arriving in the remote English village where Eel Marsh House is located, Arthur is received with attitudes of wary suspicion (and outright hostility, in some cases) by the townspeople regarding his business with the late Mrs. Drablow. He cannot account for this, until superstitious ghost stories about the old manor reach his ears–namely, stories involving a malevolent woman in black. According to local folklore, each time the woman in black in seen by someone, a child from the village dies in a horrible, tragic fashion. Arthur is dismissive of this at first, but is later horrified to find that he DOES see a woman in black at Eel Marsh House, and children from the village DO begin dying violently, one by one. This movie does a great job of weaving an eerie, uncomfortable feeling throughout. The horror is understated; it isn’t like The Grudge, where all the spine-tingling moments come from the visuals themselves. The Woman in Black takes a subtler approach to scaring the viewer, which I believe ultimately makes it more successful as a film. 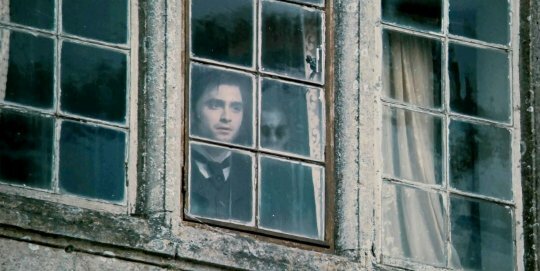 Yes, the ghostly appearances of the woman in black are extremely creepy, but it’s a combination of her unexpected presence, the camerawork, and the general sense of quiet unease that ultimately evokes fear in the viewer. I do wonder if the movie would have been a bit stronger with slightly different casting. I like Daniel Radcliffe, don’t get me wrong, but he seems a bit out of place here. He has zero fatherly chemistry with his 4 year old son, and I just don’t ever fully believe him in this particular role. Maybe it’s a case of being pigeonholed as Harry Potter forevermore, but Radcliffe as Arthur Kipps did not work for me. The character is supposed to be young, but Radcliffe seems TOO young to be a great fit. I’m not sure who could have done it better…I’ll have to think about that. Regardless, The Woman in Black is a decently executed horror flick, full of suspense and ridiculously unsettling dolls from the 1800s. A brief aside: why are old-timey children’s toys so frightening?! Tomorrow, Charles will be reviewing The Conjuring (2013), so be sure to stick with us as we close out the final days of 31 Days of Horror! !